The BC Lions announced plans for their temporary home on Tuesday, and to no ones surprise it will be located at the old Empire Stadium site at the PNE. “Empire Fields” will consist of 20.100 seats, with an additional 7,400 bench style seats in the endzones for a seating capacity of 27,500. The facility will be enclosed on all four sides and the sideline seating will be covered. A limited amount of private boxes as well as concessions, media facilities and washrooms will also be constructed. There was no indication if the fields itself will consist of grass or field turf on the clubs official release on BCLions.com. The builder of the project will be Nussli, a leading, international supplier of temporary structures for events, trade fairs and exhibitions. The time table for construction of the facility will be aproximately 10 weeks and will require a crew of 50-60 people to get the job done at a cost of $14 million dollars to be paid for by PavCo, the organization that operates BC Place stadium. Many Lions fans have longed for a return to the outdoors, and this year they will get their wish. The old Empire Stadium was a multipurpose stadium that formerly stood at the Pacific National Exhibition site at Hastings Park in Vancouver. It was originally constructed for the 1954 British Empire and Commonwealth Games and sat 32,375 upon opening, but 30,229 after 1974. The Lions called it home from 1954-1982, and the venue played host to the first Grey Cup game held west of Ontario in 1955. 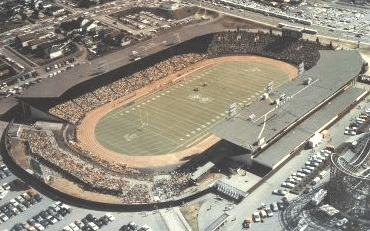 Empire Stadium also hosted the Grey Cup game in 1958, 1960, 1963, 1966, 1971, and 1974. It was the first stadium in Canada to go with a manufactured playing surface in 1970. With the reduced seating capacity, Lions tickets will be a hot item in 2010. You can make sure you’re part of this historical year in BC Lions history by purchasing your season tickets today. Give the Lions a call at 604-589-ROAR and get ready for outdoor football in 2010! Empire Stadium information gathered at Wikipedia.